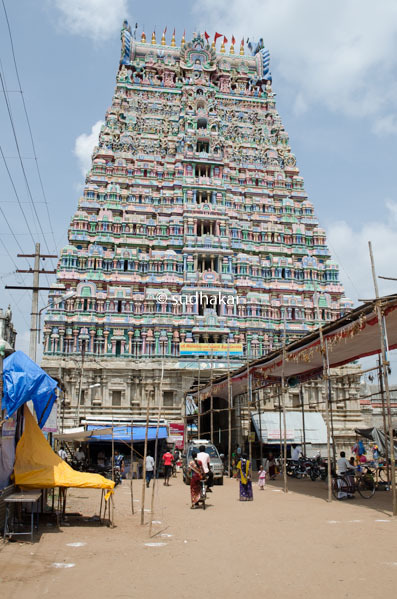 Mannargudi Sri Rajagopala Swamy Temple is one of the Abhimana Kshetram of Lord Vishnu also known as Dakshina Dwaraka or Chambakaranya Kshetram situated near Tiruvarur in Thanjavaur, Tamil Nadu. Lord Krishna appears as a shepherd boy with a whip on hand and a turban on his head. He has butter on the right hand, bangles in hand and adorned with jewels worn by children. There is a cow and two calves by His side. According to scriptures,Sage Pulastya describes the grandeur of this temple to Pithamahar Bheeshmar that whoever stays overnight in this sacred place would achieve the merit of 1000 Godhanam (donating cows). The idol of the presiding deity is majestic to behold and is 12 feet tall. The legend behind the temple goes thus. Sage Gopila and Gopralaya underwent severe penance praying to Sriman Narayana. Lord was pleased at the devotion of his devotees and instructed them to visit Dwaraka to attain the blessings of Lord Krishna. Sage Gopila and Gopralaya went to Dwaraka and when they arrived at Dwaraka, the Krishnavathar of Lord Vishnu was over. Sages were disappointed and very much disheartened. Narada maharishi advised the sages to visit this temple located in Mannargudi also known as ‘South Dwaraka’. Sages arrived in this sacred land and continued to follow severe penances and they prayed to Sriman Naryana to show them the Krishnavathar of Lord. Sriman Narayana was pleased at their devotion and once again revealed Krishnavathar and his pastimes in this sacred land. This is one of the oldest temples built in the year 1072-1150 AD by the King Kulothunga Chola I and II of Chola Dynasty. This grand temple occupies 33 acres of land with a majestic Rajagopuram of 154ft height and it has 7 Praharas, 16 temple Towers, 9 Theertham, 18 Vimanams also enshrines 24 Gods and Goddess. 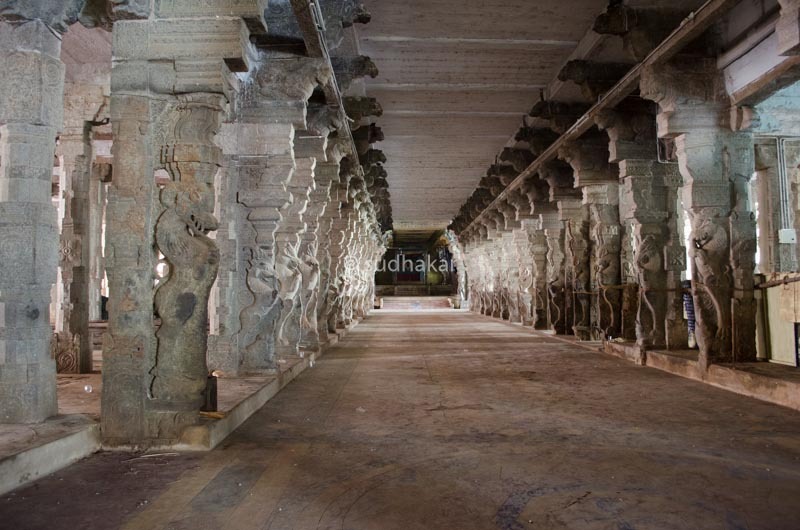 In this temple the 1000 pillar mandapam, Rajapouram and the magnificent wall encircled the temple was built by the King Vijayaraghava Nayak. There are Sannidhis for Semkamala Thayar( Hemambja Nayaki),Lord Santhanagopalan, Sri Garuda Alwar with his consort Suparni, Lord Anjaneya, Lord Narasimha, Sri Mahadesikan, Sri Yoga Narasimhar, Sri Koorthalwar, Sri Udayavar, Sri Periyalwar, Sri Kulasekhara Alwar, Sri Andal, Sri Nammalwavar, Sri Manavala Mamunigal, Thirumangai Alwar and Kumudavalli, Sri Thondaradipodi Alwar, Lord Rama, Sri Perarulalan, Sri Anantha Padmanabha, Sri Lakshmi Narayana, Sri Gajendra Varadar, Sri Vishwaksena and Sutravati Devi, Lord Ganesha, Goddess Durga are situated. 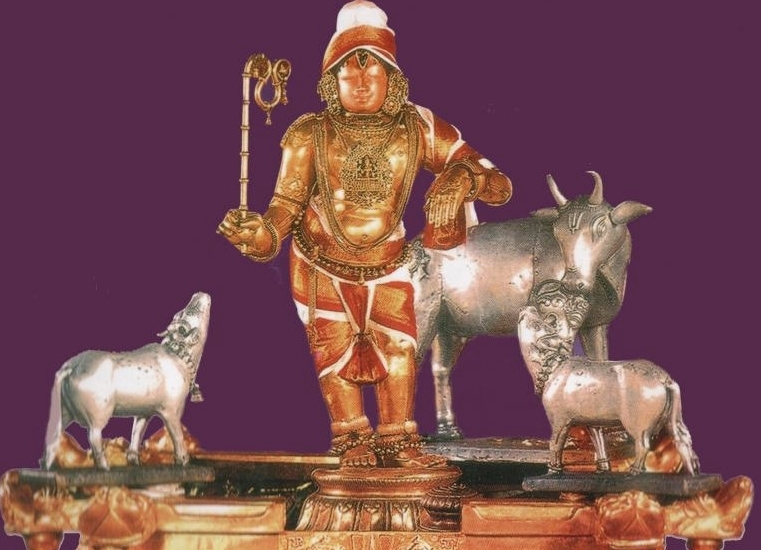 The Moolavar of this sthalam is Paravasudevan . Prathyaksham for Lord Brahma in Kritha Yuga, Sage Brighu and Goddess Mahalakshmi in Thretha Yuga, Lord Agni, Gopralaya Rishi and Gopila in Dwapara Yuga and King Rajashekara in Kaliyuga. The Thayaar in this sthalam is Goddess Semkamala Thayar also known Hemambja Nayaki. Milk is the main neivedhyam for Lord. This is given as prasad also. Dosa is the neivedhyam here in evening pujas. Temple location It is situated in the heart of the town. Mannargudi is situated 27km south west of Tiruvarur in Thanjavaur, Tamil Nadu. Thiruvarur is well connected by,road and train services. the Nearest airport is the Tiruchirappalli International Airport, located 97 km away from the town.There are plenty of buses from Thanjavur and Tiruvarur to Mannargudi. If you are driving, the roads are fairly good. Where to Eat?There are some decent restaurants in Tiruvarur. Contact Sri Rajagopalaswami Temple, Mannargudi-614 001, Tiruvarur Dist. Phone : +91- 4367 - 222 276, +91- 94433 43363. Best Season: Throughout the year. Summer( from May to July) could be very hot and dry when the mercury shoots to 40 degree celsius.